1 of 4 Heat oven to 350 degrees F. Coat a 12 x 7 1/2 x 2-inch baking dish with nonstick cooking spray. 2 of 4 Spoon rice into prepared baking dish and spread evenly. Scatter about three quarters of the broccoli over the rice. 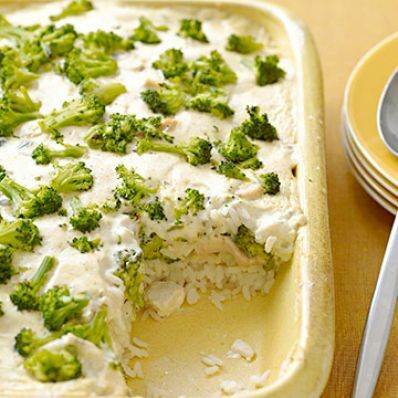 Chop the chicken and layer on top of the broccoli. 3 of 4 In a large bowl, whisk together the soup, mayonnaise, milk, lemon juice and curry powder until blended and smooth. Pour evenly over casserole. Sprinkle remaining broccoli over top. 4 of 4 Bake at 350 degrees F, covered, for 30 minutes. Uncover and bake 15 minutes.